From yard work and pest control to cleaning and taking care of home systems, there’s a lot that goes into maintaining a house. Everything Home offers practical tips and expert know-how to help anyone take good care of their home. (Family Features) A beautiful landscape doesn’t happen on its own. You can help your lawn, trees and shrubs get off to a healthy growing season. “Trees and shrubs add tremendous appeal to our urban home environments, but to thrive, particularly out of their natural world, they require regular care with added nutrients and protection against invasive pests,” said Ben Hamza, Ph.D., director of technical operations at TruGreen. Clean Up: New spring growth can be hampered if it’s covered with debris. Clean out dead leaves, branches, trash or anything else that could impair your lawn’s growth. • Don’t top-shear overgrown shrubs or trees – thin them out to preserve their shape. • Spring-blooming plants like azaleas, rhododendrons, forsythia and lilacs should only be pruned after they flower. Put the Right Plants in the Right Place: When you’re ready to plant new plants, make sure you put them where they’ll thrive. • Be sure you know the light requirements for a new plant. • Fences or other structures can restrict air flow, which can interfere with growth. 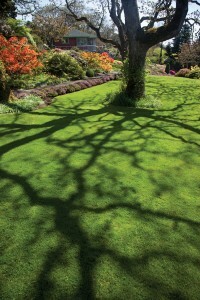 • Make sure you have the right type of grass for your lawn. Wherever grass has a hard time growing, plant shady ground covers instead. • If you’re considering sod, make sure the temperature is warm enough for grass growth. Firmly pack sod into the soil and water as needed to encourage deep root growth. • Make sure your early spring fertilizer has less nitrogen and more phosphorus to promote strong roots. Consider a professional company, such as TruGreen, which will design a custom plan to give your yard exactly what it needs. • Be sure to keep fertilizer on target to prevent run-off, and sweep fertilizer granules that may reach pavement back onto your lawn. • Follow the owner’s operating manual to take an automated sprinkler system out of hibernation. Ensure sprinkler heads and related water lines are working properly. • Make sure the irrigation system covers your landscape efficiently. For example, you can place a one-inch deep, empty food can in the middle of the lawn area to measure the depth of water collected after each watering cycle to ensure uniformity. Mulch the Right Way: Mulch can keep soil in place, reduce weeds and retain moisture. But you need to make sure you’re doing it right. • When the soil has warmed up, apply three inches of organic mulch to base of shrubs and trees to help conserve soil moisture and to reduce weed pressure. But be mindful not to cover the flare of the tree base in mulch “volcanoes,” which can lead to rot. • When your lawn is actively growing, return grass clippings back to the soil for added lawn nutrients and consider using composted materials to nourish plants.